Four configurable keys to set desired zoom level and view type. Allows to zoom out farther than in the base game. With a single key press you can open a map maximally zoomed out. With another key press you can see a large world area around you. No more scrolling with your mouse wheel! Defines how much (or how little) you can see. Decrease it to zoom out. Be careful with values lower than 0.1 as it might cause performance problems. 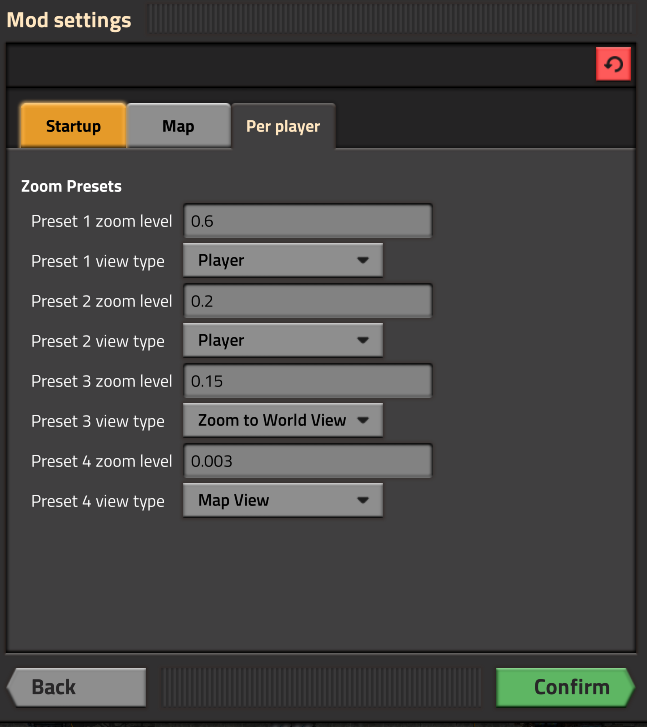 Changing from "Map View" to "Zoom to World View" resets the map's position to player's position. This is a limitation in Factorio's modding API which I have already raised to their development team. There is similar limitation when changing view type in the other direction (i.e. zooming out to map), however, if you hover over a game entity, the mod will use this entity's position rather than player's position. Removed workarounds for fixed bugs. Added workarounds for bugs introduced in 0.17.22. As a result, version 0.17.22 is now required.